With 162 days to go until the World Cup in Brazil, ESPN will debut a 60-second clip, edited down from the 90-second version above, Wednesday during the 100th Rose Bowl game. Wondering about the origin of some of the clips you see in the video? And Landon Donovan’s celebration after his last-gasp winner against Algeria earned the U.S. Men’s National Team a place in the single-elimination rounds in the 2010 FIFA World Cup South Africa. There’s no soccer column this week (or next week for that matter). Instead I wrote a front page story about Rolling Hills Estates’ Robbie Rogers, the Galaxy midfielder who has had a life-changing 2013. This isn’t necessarily a story about homophobia, gay soccer players, Christmas or family. Or it’s a story about all those things wrapped up in a plea for simple human dignity and equality. But let’s move Beyond It. The column will resume in 2014. Yes, you read that right, FC Shirak, the current Armenian champs, play the Galaxy at 6 p.m. Feb. 8 at StubHub Center in a preseason game. Tickets, which start at $17 for the general public, go on sale Jan. 14. The opposition is calculated to appeal to the large Southern California Armenian community, estimated at around 465,000 or so. Under the direction of head coach Ararat Harutyunyan, Shirak currently sit in second place with a 6-4-4 record and 22 points through the first half of the 2013-14 Premier League season. Based in the city of Gyumri in the northwest of Armenia, Shirak are led by Ivorian midfielder Serge Deble, who is tied for the league lead in goals over the first half of the season with nine. Shirak, who won the 2013 Armenian Super Cup and reached the Second qualifying round of the 2013-14 UEFA Champions League, will travel to Southern California as part of their preparations for the start of the second half of their season, which begins in early March. *The Galaxy announced today that Inglewood’s Jose Villarreal has gone on loan to Mexico’s Cruz Azul for the 2014 MLS season. The Mexican club will have the option to buy the promising striker. The 20-year-old made 31 appearances for the Galaxy last year, scoring four goals, but was generally outshone by fellow young forward Gyasi Zardes. Incidentally, Villarreal will be a teammate of San Jose Earthquakes midfielder Rafael Baca (LMU) and midfielder Michael Farfan at Cruz Azul. The Philadelphia Union announced today that the latter midfielder was bought by the club. *Also, the Columbus Crew signed 29-year-old midfielder Daniel Paladini from Chicago. The Van Nuys native also played for Chivas USA in 2008, the now-defufunct San Fernando Valley Quakes in 2007 and began his career with the Galaxy in 2006. You don’t want to go to the mall this weekend. Trust me. Stay inside and watch Cardiff City-Liverpool (live at 4:45 a.m. Saturday on NBCSN) and see if striker Luis Suarez is worth $400,000 (or thereabouts) a week or Fulham-Manchester City (live at 7 a.m. Saturday on NBCSN). Of course, the game of the “weekend” is undoubtedly Arsenal-Chelsea (live at noon Monday on NBCSN). A full preview of all the Barclay Premier League games is here. Few will quibble with the men’s selections (although I have heard ridiculous sniping about the fact all the players are from the last couple of decades, as if the U.S. had any sort of quality team before that), but should a relative newcomer like Alex Morgan (however undeniably talented) get the nod over Tiffeny Milbrett? Mexican league runners-up Club America take on Liga MX 2012 champion Club Tijuana three days after Christmas in Carson. The Xolos roster includes several Americans including former Galaxy striker Herculez Gomez, defender Edgar Castilla and midfielder Joe Corona. Club America, meanwhile, is led by former Club Tijuana coach Antonio Mohamed. Tickets are selling out fast, however, with some price points already gone. For more information, click here. In an op-ed column that ran in the nine-newspaper Los Angeles News Group today, UCLA labor professor Victor Narro slammed Galaxy sponsors Herbalife for taking advantage of economically disadvantaged Latinos as part of its routine business practices and called for a state investigation into the issue. Left unsaid in the column is that the primary sponsor of the Anschutz Entertainment Group-owned LA Galaxy and the Harbor Gateway-based American Youth Soccer Organization is Herbalife. These are natural sponsorships given the U.S. Latino population’s love for soccer, but clearly raises questions about the economic relationship between the company, the sport and a vulnerable demographic group. 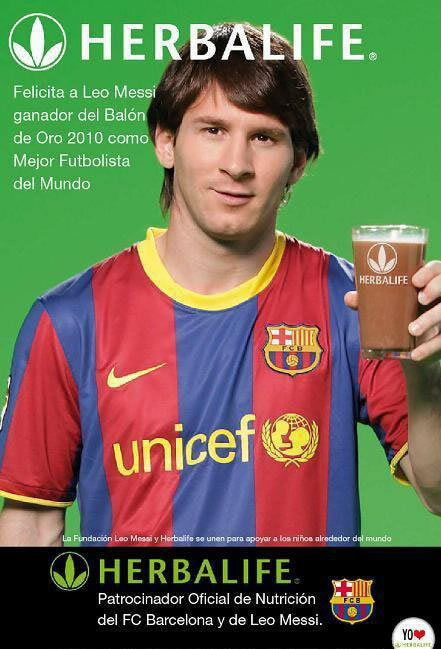 Herbalife is no stranger to controversy and government investigations, but it appears AYSO, MLS and the Galaxy are much more interested in looking the other way given the millions the company contributes to soccer in this country (and around the world for that matter as the Herbalife ads illustrating this blog post demonstrate). While we’re on the subject of questionable business practices, it should be noted that Galaxy rivals Chivas USA shouldn’t be gloating over this negative publicity either. 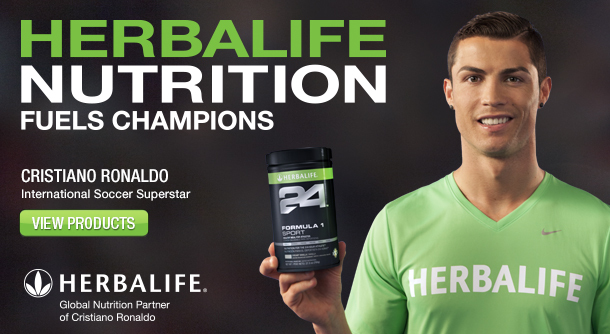 That club’s owner, Jorge Vergara, has enriched himself with a Mexican version of Herbalife dubbed Omnilife that uses a pretty much identical marketing scheme. And lest I forget, this kind of stuff seems endemic to soccer with Real Salt Lake recently exchanging one sponsor for another multilevel marketing company. Incidentally, I invite a response from the Galaxy, MLS, Chivas USA, Real Salt Lake or AYSO either in the comment section on this blog or in a separate post. And the award is: most searched soccer player name of the year. Yup, Landon Donovan beat out the likes of Clint Dempsey, Wayne Rooney, Tim Howard, Luis Suarez, David Villa, Thierry Henry, Robin van Persie, Eden Hazard and John Terry, who all rounded out the top 10. 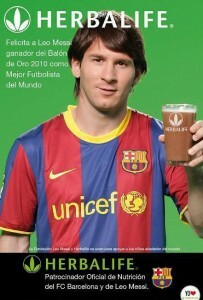 Oh, and the most searched soccer team? Manchester United, but then you probably guessed that. The Galaxy didn’t make the top 10 of that list, however, with the Portland Timber’s the top-ranked MLS team at No. 4. For more on Google’s top search lists click here.